4 months ago I started working on my 1st quilted quilt. Yes, I've made a couple of rag edged quilts, but this was the 1st time I've attempted a quilt with sandwiches and batting and binding and everything. 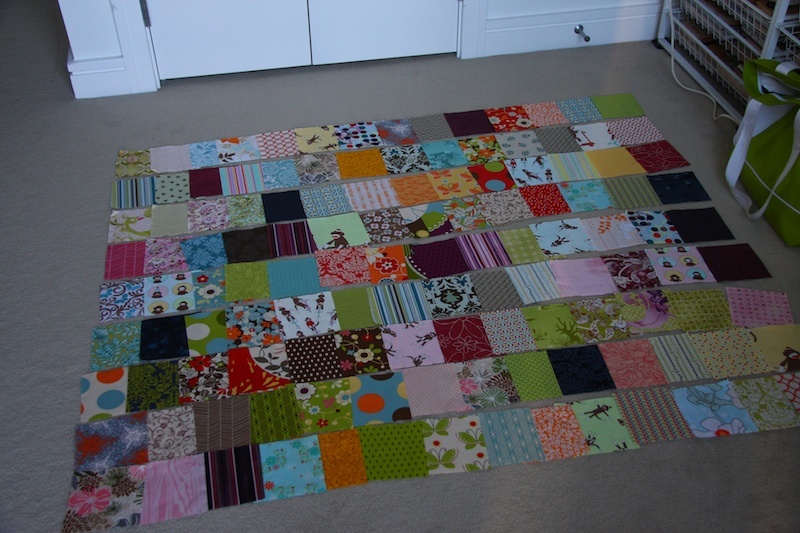 It's a super simple patchwork quilt made from charm packs. I've been collecting charm packs for years. I think I bought my first one in 2006 and managed to find 5 more I couldn't live without. The quilt I wanted to make required 252 squares. 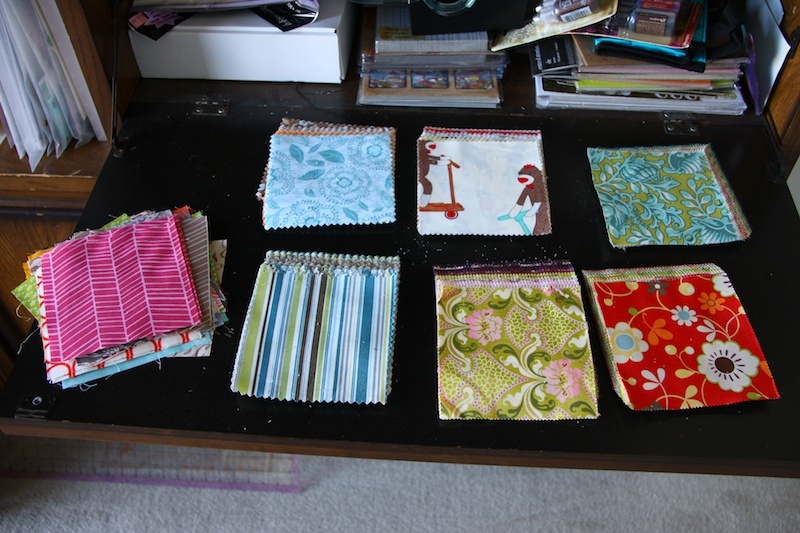 I needed a few more squares than the charm packs had so I visited my local fabric store and bought a handful of fat quarters to fill in. That's the pile on the left. Believe it or not, I actually set each square out on the floor to make sure that the randomness actually looked random. Does that make any sense? I didn't want a bunch of blues bunched up together, or a bunch with the same pattern together, plus I wanted to make sure the patterns were facing the right direction. Oh, and have I ever mentioned that I hate ironing? I didn't realize how much ironing you need to do when you quilt. Putting the quilt top together went pretty fast. Aside from the ironing. 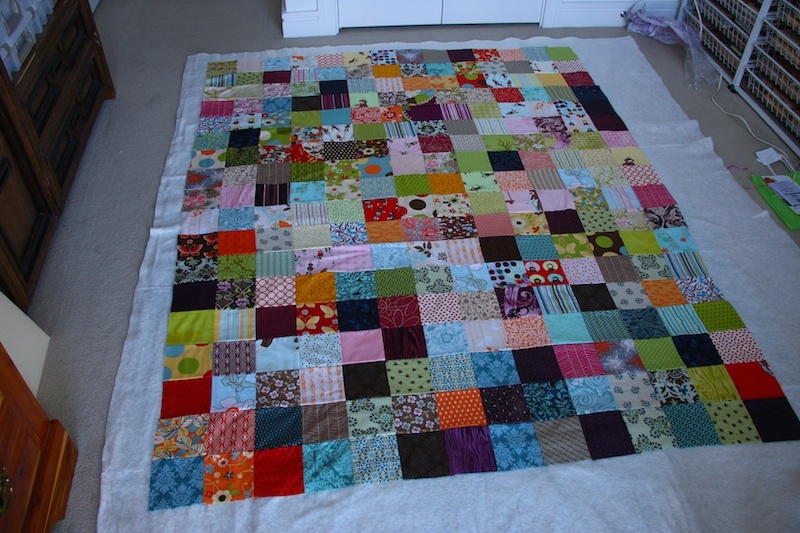 Since this was my 1st quilt, I tried not to get to crazy on being precise, otherwise I would have driven myself crazy. That's why I chose to do a simple 5" square patchwork for my 1st quilt rather than a complicated pattern where my points and edges had to match up exactly. As it was, making sure my corners were together was hard enough and I had to let go of some of my OCD and just go with the imperfection. 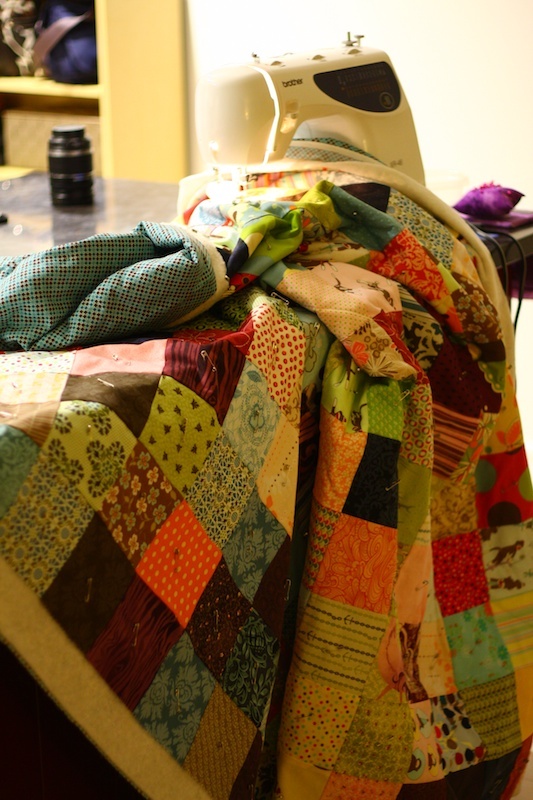 Now pinning everything and then trying to quilt all 3 layers of the sandwich was a Challenge with a capital C. How do you quilters squeeze all that material through that tiny space between the needle and the main part of your machine? Man was that tedious! I had to stand to quilt them all together because the biggest counter space I had was my kitchen counter. Anyhoo...I finally finished quilting all of it together. I haven't touched it since the beginning of June. That's because I need to do the binding. And I'm skerd. Very skerd. I've watched lots of videos online, but still haven't made the attempt. I will someday though. Hopefully soon. Maybe when the temperatures cool off and I don't mind having a big quilt on my lap again. OOOO I love this quilt! Congratulations to you for attempting something so big. I love the colours. 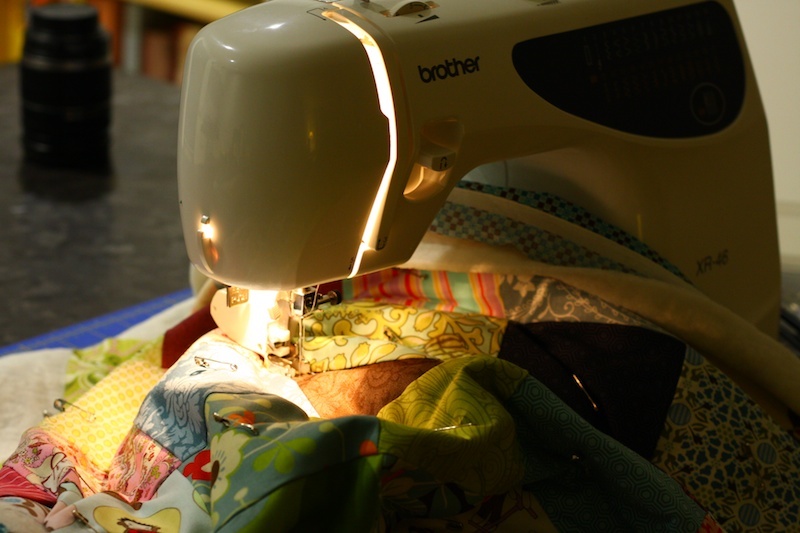 I have only done machine quilting on baby quilts as it's really hard to manipulate a huge quilt on a domestic sewing machine, as you have found out. DOn't be skerd of the binding. The secret to good binding is to cut everything really precisely. There are lots of videos and instructions on how to do tidy mitred corners etc via the internet. My advice is to throw together a small quilt made of leftover scraps.... like a dolls quilt.... and bind that and see how you make out. And if you like I'll pop over to help you. Put the coffee on! oh you gave me hope. i've always wanted to quilt, but i'm as you said "skerd". but getting this "randomness" idea from you makes me very hopeful. keep us posted.